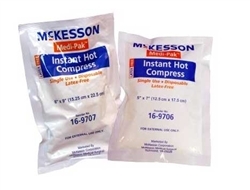 McKesson Medi-Pak Instant Hot Compress is a single use disposable hot pack for use in treating sore aching muscles. 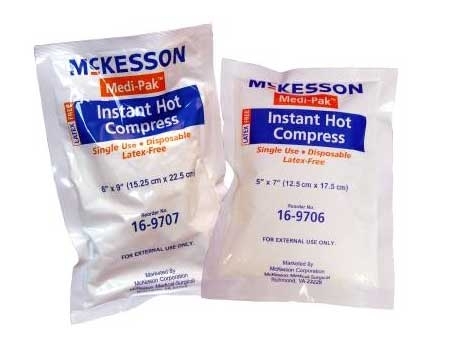 Medi-Pak Hot Compress packs are activated by an instant chemical activation process. They do not require a microwave oven or power source to activate. Medi-Pak hot packs are perfect for heat therapy to soothe muscle aches and soreness. These are also popular with people that may want a temporary heat source to warm hands or feet when they are outdoors for activities such as skiing, hunting, hiking and camping. MediPak Hot Compress is not made with natural rubber latex. Wrap in a soft cloth or towel and apply. Discard after single use. CAUTION: PEAK TEMPERATURE MAY REACH 160 DEGREES F ONCE ACTIVATED. Avoid contact with skin. Use cloth or towel for protection. Do not use for more than 30 minutes. CAUTION: DO NOT REUSE. For single use only. Dispose of properly after use. Do not attempt to reuse this product by heating as injury may result. WARNING: FOR EXTERNAL USE ONLY. HARMFUL IF SWALLOWED. If solution is swallowed, drink several glasses of water and contact a Poison Control Center immediately. DO not puncture bag. Check patient and compress regularly during product use to prevent leakage. Discard leaking pack immediately. Should contents become exposed to skin or eyes, flush with water immediately and contact a physician. KEEP OUT OF REACH OF CHILDREN. Supervise children during use. Do not mix with combustible materials. Do not expose to extreme heat or open flame. Do not freeze. CUSTOMER STORAGE: Store at room temperature prior to use.